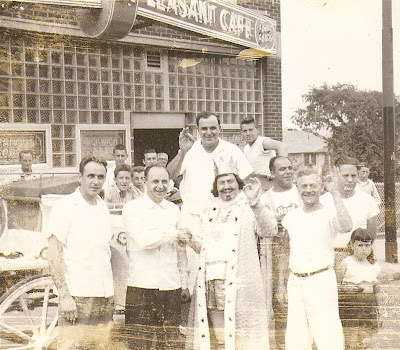 Feliciano and Carmella Iantosca opened the YD meat market in the early 1930's. In 1939 four of the sons incorporated and began to run it as The Pleasant Cafe. Uncle T (Attilio), Grandpa Al (Emilio), Uncle Pompey (Palmarino), King Knickerbocker (of Knickerbocker Beer), ?, ?, ?, John Prada, and Carmelina Prada. 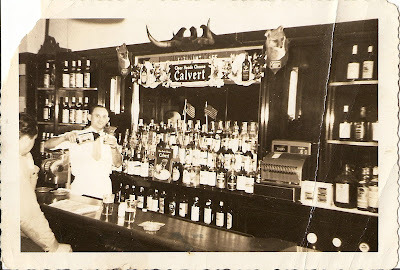 Grandpa Al pouring liquor at the bar, as he did for 41 years (1938-1979). I love the old pictures and the history you have found out! I miss grandpa so much! I really really do! Wow, Julie. Thank you for doing this. I miss Grandpa, too!